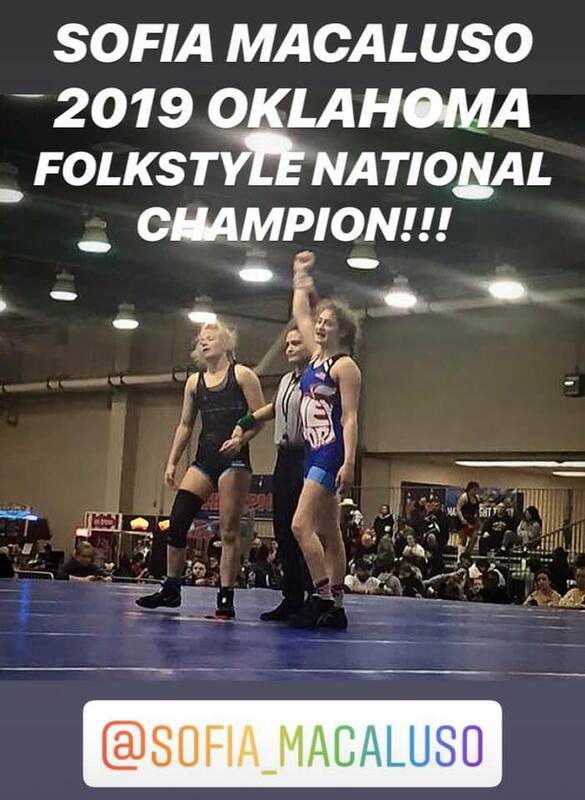 Congratulations to Minisink Valley freshman Sofia Macaluso for taking 1st place at the 2019 Oklahoma City USA Wrestling/USMC Girls Folkstyle Nationals in both the Junior Division and the 16U Division! Sofia was one of only two girls to win the title in both divisions. Macaluso went 11-0 for the tournament and recorded 5 wins via pin! Great job Sofia!!! Fellow Minisink Valley Warriors Mia Macaluso and Grace Pauls also competing in the tournament and both left Oklahoma City with All-American hardware! Mia competed in the 132 pound Junior Division and made it all the way to the finals before dropping a 5-0 decision in the finals and taking home 2nd place honors. Pauls, wrestling at 138 in the Juniors, went 4-2 for the tournament and finished in 7th place. All four of her wins were by pin! Great job ladies…All-American ladies that is!! !